The New Norfolk Market in High St is set to expand. JUST three weeks into the three-month trial of a community market in High St, the space allowed for stalls has been increased by the Derwent Valley Council. Last week's monthly council meeting considered and agreed to an urgent request to expand the market's footprint. In a supplementary agenda item, council general manager Greg Winton said the New Norfolk Street Market was operating on a trial basis on Saturdays between 8am and 2pm. "The section of High St in use for this purpose is between Burnett and Charles Streets," Mr Winton said in his report. Mr Winton said the organiser of the market had proposed increasing the originally-allocated area to improve accessibility and safety, and to accommodate the demand for stall space. The general manager did not provide a copy of the proposal with his report to councillors, saying it was only brief. After a 30-minute discussion, councillors voted unanimously to expand the area available for the market's trial period. Stalls will now be able to be laid out on High St between the Burnett St roundabout and the Stephen St roundabout. The council will also allow up to three market stalls to be placed on Lee's Corner. Mr Winton said a survey of the economic and social impacts of the market would be conducted following the November 25 market. 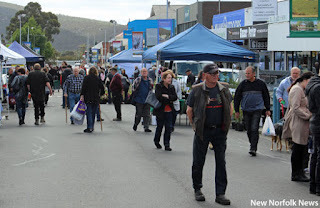 The Market is great except it has now become very higgledy piggeldy with stalls on the footpaths and vehicles allowed. The shambles in the Lees Corner area was just that last Saturday.Please, no stalls on the footpaths - negotiation is already quite difficult with the plethora of signage and the spreading of tables and chairs! Make it neat organisers. I agree with those comments. Far too much junk stuff and not very well set out.Should not be any cars or utes or similar. Shame for it to go to the pack so quickly. Reckon it could be fixed up tho. Not many people this week as a lot of other things on elsewhere.